Working for the largest wholesale manufacturer of foam monument signs, I field a considerable amount of inquiries on a daily basis. Surprisingly, one of the most common inquires I receive from retail sign shops is "How do I clean a foam monument sign?" So here's the best 'Solution'. Cleaning a foam monument sign doesn't have to be a monumental task; the procedure is quite simple when you following the step-by-step cleaning process outlined below. Monument sign maintenance is a value-added service. You can offer your clients monument sign cleaning service at an additional cost or share the process with your clients to help them keep their monument sign looking good this summer and for years to come. Maintaining the appearance of your foam monument sign is the best kept secret to keeping your monument looking good for years to come. Most monument sign manufacturers recommend cleaning your monument at least once a year. This ensures that all surface molds, grime and dirt is cleaned off your monument, eliminating build up year after year and restoring luster to your foam monument sign. Besides a nasty looking sign not only detracts from the message on it, but is also communicates a less than idyllic message about the sign. So let's take a plunge into how simple and easy it is to make and keep a foam monument sign free from those detractors and shining it's message lound-and-clear to all those prospective clients passing by, like it should. Step 1: Clear the area of debris, leaves, garbage, etc. Prior to starting the cleaning process, survey the area for any garbage or debris. Rake up leaves and dispose of any other unnecessary rubbish. Step 2: Gather sign cleaning materials. You will need the following materials: a sprayer or garden hose, household bleach (such as Clorox), mild dish detergent, scrub brushes and a measuring cup. *It is important to note that foam monument signs are not designed to be cleaned with a power washer. 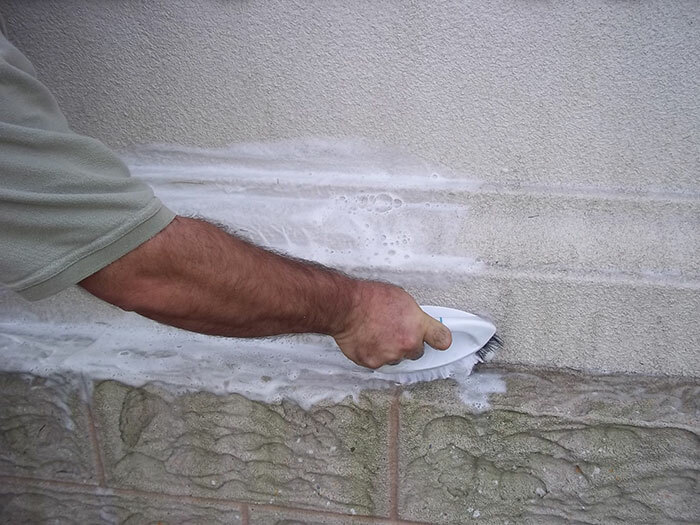 Power washing is considered an improper cleaning method and could void the product's guarantee. Step 3: Hose down surrounding plants. Spraying all surrounding foliage will ensure that any overspray from the diluted bleach cleaning solution will be diluted and will not cause harm to the plants. *The plants should be dripping wet. Remember, the cleaning solution includes bleach. Step 4: Pre-rinse the face of your foam monument sign. Your monument sign should be wet before any cleaning solution is applied. This initial rinse will remove loose dirt, providing a good foundation to apply your cleaning solution. *The face of the monument should be dripping wet. If it is a humid day, you may need to spray down each side independently before applying the cleaning solution to achieve the best results. Step 5: Test your solution. 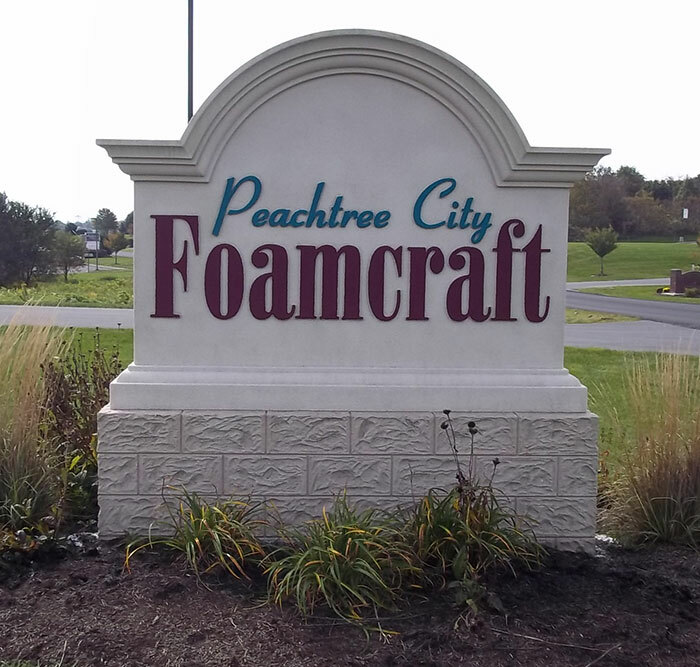 The Foamcore Monument Sign cleaning solution recommended by wholesale monument sign manufacturer, Peachtree City Foamcraft is 3 parts water, 1 part bleach and a generous amount of mild dish detergent added to the mixture. Before spraying your entire monument sign - test a small area of the sign to ensure that no adverse reaction between the bleach solution and any special graphics such as vinyl, plastic or metal graphics. *It is important to note that each monument sign manufacturer utilizes different hard coat and finishing systems in the manufacturing process of their respective monument signage. 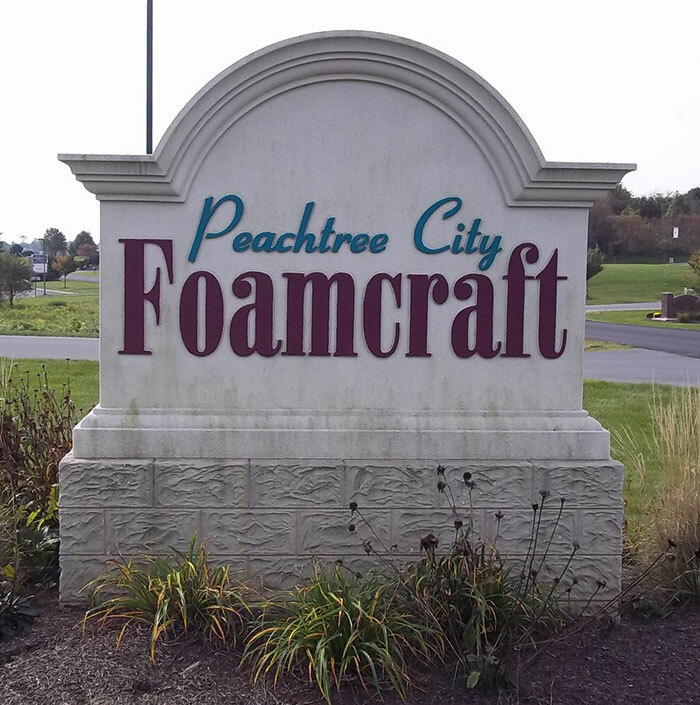 While this process has been tested and is recommended to clean foamcore monument signs manufactured by Peachtree City Foamcraft, we encourage you to check with your manufacturer prior to applying the cleaning solution to ensure that no adverse reaction will occur. Step 6: Wash Time. 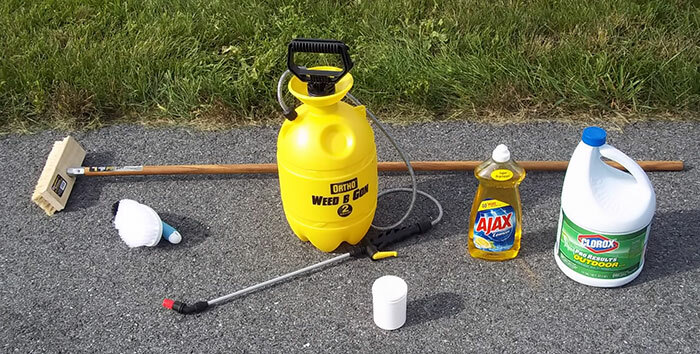 Now that you have tested your solution, spray or scrub your sign down using the cleaning solution. Once your monument sign has been covered and rinsed, you can repeat as necessary. If your monument sign is clean to your satisfaction, you are done. Conversely, if there are still areas that need more attention - we recommend proceeding to Step 7 for a deeper clean. Step 7: Deep Clean. 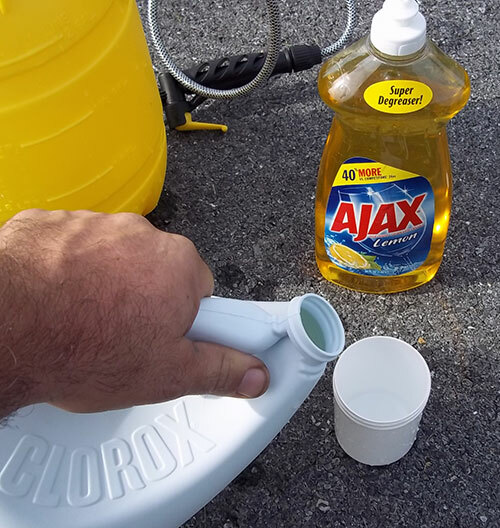 Fill a 5 gallon bucket with your cleaning solution. 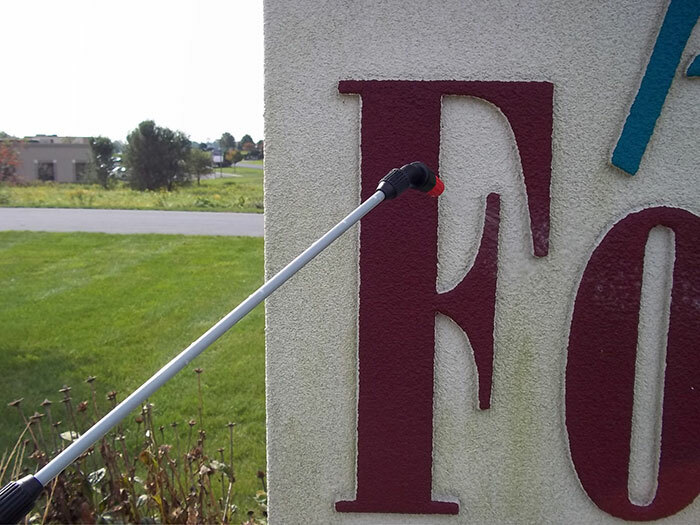 Take a long handled scrub brush and scrub down areas of the sign as needed. Manually scrubbing your monument sign will agitate any dirt and mold from the face of the sign. Rinse your sign and you're done! Now that you know the procedure necessary to clean your foamcore monument sign, let's explore some of the additional direct and indirect benefits of monument sign maintenance. One very direct benefit of maintaining monument signage includes an immediate improvement in appearance and the ability to inspect your monument. After a monument sign is cleaned, the improvement in the appearance will be instant. Indirect benefits include the value that will be placed upon the signage and your company as you become a trusted partner for your client's signage needs. This gives you a great opportunity to touch-base with your client and determine if they have any current signage needs each year. As I mentioned earlier, monument cleaning is truly a value added service, the gratification is instant. The renewed appearance of the monument sign will remind your client of the pride they felt when the sign was first installed. It is the same way you feel after washing your car. We know what is underneath, but it looks and makes us feel so much better after a good cleaning. Reintroduce your client to the value of their signage. After the cleaning is complete, take time to catch up with your client and determine their current or future signage needs. The most successful retail sign shops will tell you that relationship building is imperative. Offering solutions and value to their clients fosters repeat business and mutually satisfying relationships. What are you waiting for?!? Grab your scrub brush, bleach, a five gallon bucket and some mild dish detergent and your client list. Your client's signs will look great and a good cleaning could be the key to landing your next big signage project!